A cold foam mattress is the right mattress if you choose for a even distribution and a comfortable punctual support. 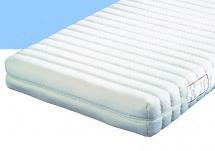 The core of the cold foam mattress is formed by memory foam, in which a structure of channels and profiles is fitted. The intensity and precision with which this has occurred, determine the properties and price of the mattress. Important for the preservation of the mattress is to reverse these regularly and use a mattress underpad.